hymns that have arisen from the Christian experience of African Americans, Native Americans, Asian churches, Spanish-speaking churches, the Gospel song tradition of the 19th century, and the Sacred Harp tradition of colonial America. We sing from the hymnal, rather than projecting words on a screen, because in the hymnal many worshipers can sing their appropriate musical line – soprano, alto, tenor, bass-baritone, the harmonies of which make for a richer spiritual experience. We are guided by our congregational singing by the organ, the sensitive playing of which enhances congregational song, where no individual voices stand out, but rather we celebrate and experience our unity in Christ. Our music also includes the dedicated talents of our volunteer chancel choir and hand bell choir. 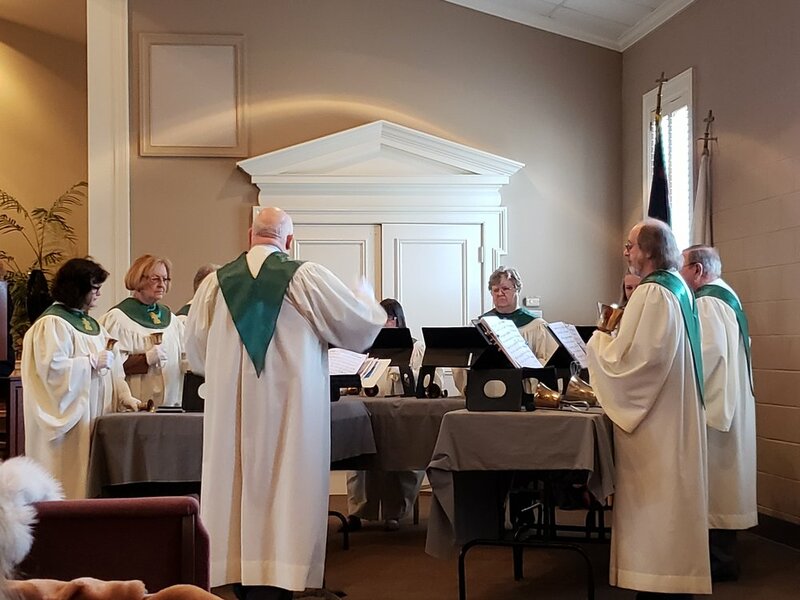 The chancel choir sings an anthem almost every Sunday and the hand bells play on average once per month, more often in the joyous seasons of Christmas and Easter. The choral and bell music lifts all of us to a place nearer the heart of the God of sovereign love.